our perfectly imperfect life: Think about it. Don't pity them. Don't talk down to them. Be open to them. Be open to people. It changed my life, I think it would change yours. Talk to them. Be their friend. Love them. Hug them. Do anything to raise the spirits of people with different abilities. It is like God taking something away from them in one area and making them extraordinary in other areas. Break down the walls. Break down the stereotypes. Break down every wall you can. I have been told before that I am too sensitive when it comes to the R word. Quite honestly, that is hurtful. Just as hurtful as the R word. Is that what you are going to tell my girls too ... when one day they inevitably will come crying to me because their feelings are hurt after hearing someone called them retarded? Are you going to tell them they are being insensitive too? 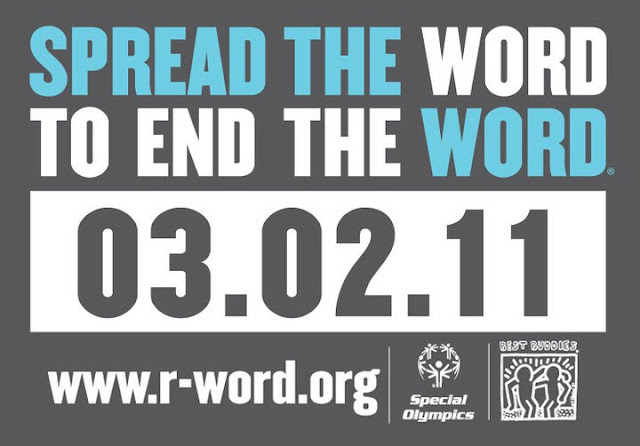 Do you realize just how often the R word is thrown around? I know. I used to be one of those people. How ignorant was I? The I-didn't-mean-it-that-way arguments are meaningless. It doesn't matter how you meant it. Using the word insinuates so many things about my girls ... about any person with an intellectual disability. 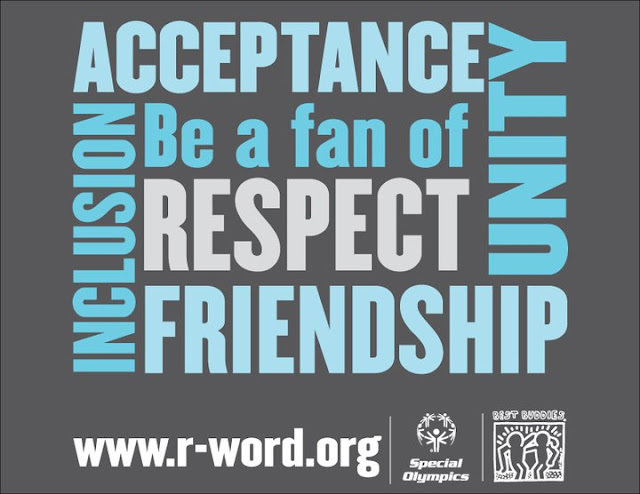 Is there anyone in your life that has changed your perspective of the use of the R word? my cousin. second cousin, really, born to my grandmother's sister when she was past the years of planning for children. he was older than me by a few years. he was a gentle soul who loved the world and his family fiercely. hugs. always hugs. and love. unconditional and pure. and honest as the day is long. he once told me he thought my dress was ugly, but he liked the bows in my hair. he was right. the dress was ugly. but the bows had always been my favorite. i wish i had been older, more comfortable with our differences. i wish i had tried to see the world as he did. he is older now. and we live forever apart. but i think of him when i visit your site or Kelle's. and i wonder, how much easier would those early years have been for my grandmother's sister if our smallish town had held parades in honor of his magic chromosomes, instead of mocking him and shying away from supporting her and her family. thank you for standing up, speaking up. i'll join you in your call. i'll join any parade you put together. That first video tears. me. up!! Every time I hear that word on t.v. or in a movie it makes me want to throw up. I put the link to Spread the Word on facebook. My Dad had a brain injury, and was institutionalized in the 70s. The word retarded was hurtful then, and it's hurtful now as I try to raise my boys. Your family is perfect. Take heart that more and more people are becoming aware. Change is slow, but so worth educating for. I agree. I was one that threw the word around not knowing until I had a child with special needs. For our community it is the word "midget" that is like a stab in the chest. Since then I cringe when I hear anyone use either term. It's changed the way I view the world. I hope we can end both words. Hi Bethany! It's been awhile since I visited your blog! 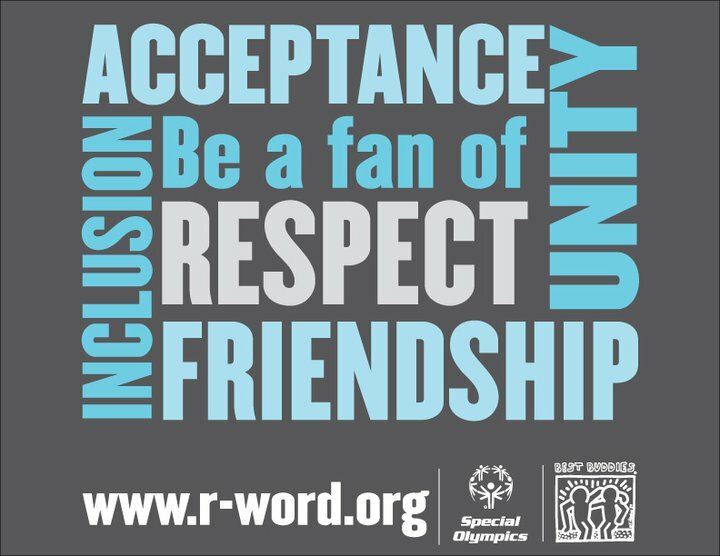 I've been meaning to do a post on the R word and yours inspired me. Thanks for making my job easy by having all the videos in one place!! Your kids are getting so big and are as gorgeous as ever! !